Shop While Texas Electricity Rates Are Low! Texas electricity prices are heading back down from summer highs —but they won’t stay low for long! Should I Shop Now For A New Texas Electricity Plan? When you click on the graph showing Texas historical electricity rates, you’ll see those high Texas retail electricity prices from the summer are settling back down to normal. 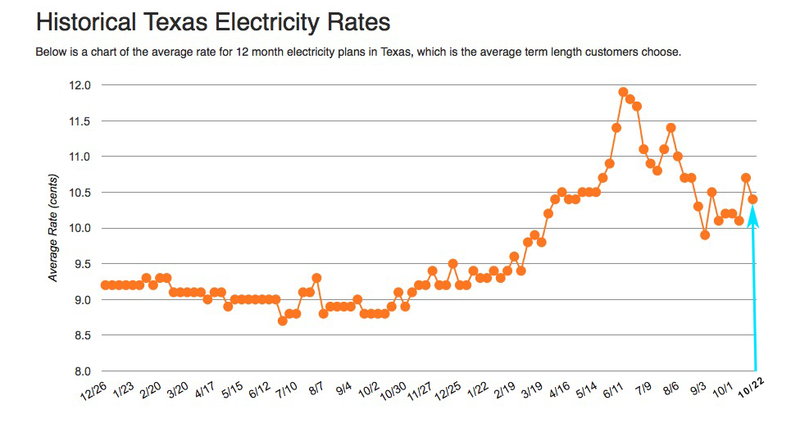 That’s all because since the summer cooling crisis gone, Texas electricity providers are now bringing down their prices. That’s great news for homeowners in Dallas and residential electricity customers in Houston as well as the rest of the Lone Star state. Nicer still is that electricity prices are at their lowest rates now since last February. Not surprisingly, lots of folks are asking if whether they should be shopping for a new Texas electricity provider. The answer is an emphatic YES! In fact, you do it sooner than later. EIA market analysts predict that natural gas prices are expected to rise. Since most electric power plants in ERCOT burn natural gas, Texas electricity consumers should expect electricity prices to edge a little higher as cold weather arrives. Texas and lots of other states burned LOTS of natural gas from June through September to generate a lot of electricity. So much that in July, natural gas amounts in storage fell below the five year minimum and have stayed there. Though there’s no dire shortage (more gas is still being put into storage), the low level has been affecting natural gas futures. Here’s why: the five year minimum is 3,325 billion cubic feet (bcf) and last year saw an ample October storage amount of 3,638 bcf. According to the EIA’s weekly natural gas report, last week’s level was just 3,037 bcf. That’s roughly 300 bcf below the five year minimum and 600 bcf below last year. Natural gas traders are naturally wanting to cash in on the combination of low storage levels and high demand from cold weather. In fact, over the past couple of days, natural gas traders’ eyes fixed on weather predictions for the next 21 days in the hope that a forecasted blob of cold weather actually would set in over North America at the end of the month. But on October 18, when the forecast changed to more moderate temperatures both the spot price for natural gas and the NYMEX November contract price fell by around 10¢ . Sounds good, right? No cold weather and retail energy prices in Dallas and the rest of Texas will stay probably stay low for the next few weeks. But…when will the weather turn cold? NOAA’s 2018-2019 Winter Outlook favors warmer temperatures for much of the U.S. partly due to an expected El Niño emerging sometime in November or December. Although weak, it’s expected to exert enough influence along with other factors that will bring “above-normal season mean temperatures” to the lower 48 and Alaska. Texas will likely see somewhat cooler, wetter conditions. ERCOT forecasts the state will be close to normal temperatures — not quite as cold as last winter and not as warm as the two winters prior. The obvious good news here is that natural gas prices will likely stay low for just a little while longer and the same follows for electricity prices in Texas and the rest of the U.S. There’s also the good news that the longer that temperatures stay seasonally warmer, the more natural gas can be injected into storage. Since the speed at which stored gas gets drawn down depends on the severity of winter weather, the more that goes into storage, the less likely for energy prices to rise sooner — especially as the storage amount draws nearer to that psychologically-important five year minimum level. Of course, this assumes that this year’s injection season ends by the second week of November. So in reality, there’s not a whole lot of time left until wide-spread cold weather will start firing up natural gas furnaces up north and start drawing down the supply. Should I Shop for a New Electricity Plan? IF fall temperatures can stay nice for just a few weeks longer and more natural gas makes it way into storage, then natural gas prices might rise less than predicted. IF the U.S. north has a warmer winter, there’s a good possibility that EIA’s predicted energy prices rises won’t be as high. IF Texas winter temperatures will in fact be more moderate than last year, then consumers’ heating bills might not be as high. Unfortunately, that’s a lot of “IFs”. And a LOT of uncertainty to contend with when you’re trying to gauge when to go shopping for a new electricity plan. While we don’t know by how much, we are certain that electricity rates will likely rise this winter in response to the demand for the amount of natural gas available. Consequently, putting off shopping for a new plan will only land you with a higher rate. It might not be much higher but over time, the extra expense will add up. On the other hand, electricity rates are currently at their lowest since last February. By locking a fixed rate at the current price for twelve months or more at https://www.texaselectricityratings.com, you can shield your wallet from additional expense plus next summer’s hot, high prices. 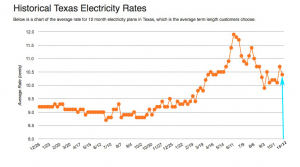 So, the best choice that will help you save money is to shop for the cheapest Texas electricity rate NOW! Check Out Our Money Saving Tools! Texas electricity customers can use our new tools make shopping for your best, lowest rate easier than ever before! Just plug-in prices and term information from ANY plan’s EFL (even if it’s from a provider on PowerToChoose) into our Plan Analyzer. You’ll find out how a plan compares with other similar plans and learn how much you can expect to pay each month of the year! If you’re not sure about what sort of plan you need for your home, our Plan Picker helps you narrow down your options to the ones that are important to you. Not only can customers find a plan that best fits the way they live, they also find it using the most convenient and efficient way. Is Wireless Power Coming To Texas?